A little girl born in South Georgia, raised by Warren Mannings SR and Mary Smith, very hardworking parents that she admired a lot. She was often irritated by two little brothers, Warren JR and Fredrick Mannings, that she loved so much. While being surrounded by an overflow of love from a big family of grandparents, aunts, uncles and cousins. She grew up with a strong foundation of family, love and most of all, faith in God. This is who I am, Jacqueline L. Ervin. Jack or Jackie, depending on if you were a family member or a friend from school. Born Jacqueline L. Mannings, November 10, 1967 in Cairo Georgia. A young girl with expectations bigger than the clay and dirt road that led to her house. From the beginning she was destined to do great things. Always remembering the inspirational words of her teachers that she could be the best at whatever she applied herself to. Jack took off and never looked back. Her travels as a young women outside southern Georgia started February 3, 1987 when she married Vincent B. Ervin. This also begin a closer relationship with God, dealing with being away from home for the first time, being a wife and also being a mother. Growing up attending Sunday school and going to church at Oakgrove Baptist Church was key in her early preparation. She would travel the world to find out that God was real, he answered her prayers, he would show her things before it happened and she was able to hear him. A wife for 28 years and a mother to Vincent B. Ervin II for 19 was achieved by always keeping God first. Her experiences with God kept her prayerful and always writing. A true Christian will have a heart for people. This is the way Jacqueline lives with little or no effort. She is very well known for always trying to help someone with their problems. Jacqueline L. Ervin has been writing words of encouragement for the last 10 years. Her mission is to encourage as many people as she can and to lead them to Christ. A word of encouragement can change how a person feels, think or behave. God has a way of changing the atmosphere with just a word. There is a word of encouragement for each day of the year. 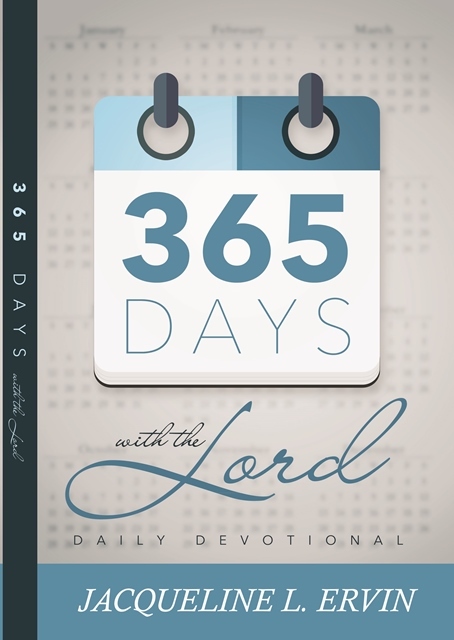 “365 Days With the Lord” gives you strength and comfort knowing that God is still in charge and there is nothing that can separate you from the love of God. Trust God and allow Him to mentor to your heart, body and soul.